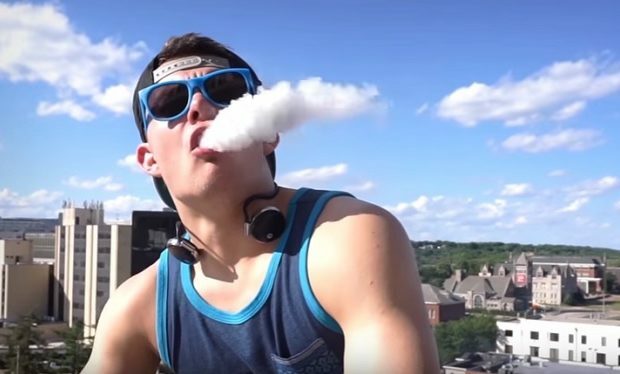 Check out this vape dude’s aspirations to participate on the show America’s Got Talent. We’ve all got a friend who vapes one of those walkie-talkie looking devices. They shamelessly exhale mushroom cloud-sized , fruit smelling vapors for all of us to enjoy. At least that’s what they think. Instead, I think these vape dudes are comical. Hell, you might be one of them – my bad. Jake Clark, the star of the America’s Got Talent “audition” video below, is trying to make his vape bombs America’s next favorite pastime. Hopefully, Clark is just poking fun at the same things I am, but if he is serious, and he wins, we are all in deep deep trouble. I’ve been vaping since I was about nine years old. I think vaping is the best way that I express myself. The best way you express yourself? C’mon bro look at your outfit and shades. You are nothing short of a modern day Blues Brother. Expression is not Clark’s issue. Unlike the stereotypical stoners who skip class because of smoking (or vaping) some herb, Clark believes he would choose his nicotine vape over “normal” interests. You know I wasted a lot of my time in my younger years with sports and school and other things that weren’t important to me. Again – c’mon bro. You’re telling me that school and athletics were a waste of your time and that vaping is a total better use of said time? I sincerely hope Clark wins America’s Got Talent, because if he is serious about this, he might not have many other options. Jake Clark should probably take a few real vapes and think very critically about the path he is on. From what I can tell, people who use vapes are more concerned about health and their hobbies than this fella. Have a look for yourself below. Do you have talent? Is it vape talent? Could you beat Jake in a “vape-off”? Let us know on social media or in the comments below.